The number of participants more than doubled. The amount of prayer for the group grew, too. But for members of the “Race for Vocations” team that took part in the One America 500 Festival Mini-Marathon on May 2 in Indianapolis, nothing was more significant than being a witness for Christ and vocations. Just as important was the opportunity to reflect on the Scripture verse that guided the team this year: “I have competed well; I have finished the race; I have kept the faith” (2 Tm 4:7). “Nothing has taught me more about what it means to be completely dependent upon God than these months of running [while training for the race],” said Erica Heinekamp, a member of Our Lady of the Greenwood Parish in Greenwood, who is also a member of Communion and Liberation, an Italian-based Catholic lay movement. Father Rick Nagel, archdiocesan associate vocations director, the team’s organizer, said that 205 people signed up to be a part of this year’s “Race for Vocations” team, up from 90 people in 2008. Among the group this year were 10 seminarians from Saint Meinrad School of Theology in St. Meinrad, and six seminarians from Bishop Simon Bruté College Seminary in Indianapolis. The “Race for Vocations” team was made up of people who participated in the mini-marathon, commonly known as the “mini,” or in the Finish Line 500 Festival 5K, which is run at the same time. More than 30,000 prayers—Hail Marys, Our Fathers, novenas, rosaries and Masses being offered, to name a few—were pledged for the team. That figure nearly matched the 35,000 participants who competed in the 2009 mini-marathon. “We were above last year’s” prayer pledges, Father Nagel noted. “It’s really a beautiful part of it, just to know people can participate in their prayer commitments,” he added. Prayer was also at the heart of the team’s activities the night before the race. Archbishop Daniel M. Buechlein was the primary celebrant during a Mass for vocations on May 1 at St. John the Evangelist Church in Indianapolis. “Friends, what is our finish line?” the archbishop asked in his homily. “Since the day of our baptism, the day we were united to Christ in a very special way, our goal is union with him, ultimately in the kingdom of heaven. Nineteen priests, including some who were members of the “Race for Vocations” team, concelebrated the Mass. About 230 people attended the liturgy. A pre-race pasta dinner took place afterward. The dinner was sponsored by the Serra Club of Indianapolis. Members of Bishop Chatard High School’s vocations promotion club SERV (Students Encouraging Religious Vocations) also volunteered at the Mass and dinner. During the mini-marathon, “Run for Vocations” team members—who again wore shirts with the printed message “Vocation … Everyone has one. What’s yours?”—were consistently affirmed and asked questions, Father Nagel said. One team member, a student at Indiana University-Purdue University in Indianapolis, was mistaken for a priest by some other runners, who asked for his blessing, Father Nagel said. Though the “Race for Vocations” is a young adult-sponsored activity, the team is open to people of all ages. Father Nagel said this year’s group included people from all walks of life. The team also included two families with young children and a cancer survivor who walked the 5-kilometer portion of the race, Father Nagel noted. Ruth Hurrle, a member of St. Jude Parish in Indianapolis, made the event a family affair. She convinced her brothers and sisters and their spouses to join her training group of 14 runners. The Lafayette Diocese, which joined this year’s effort to promote the “Run for Vocations” team, sponsored a tent in Military Park in Indianapolis near the mini’s finish line, where members of the team met after the race. “That was a real blessing to the whole thing because there was a sense of community afterward,” Father Nagel said. While the team’s ultimate goal is building up a culture of vocations in the archdiocese, Father Nagel said he has found the “Race for Vocations” experience to be “very humbling” both years. “I see the love that people have for the Church, and that they want good priests and want good religious, and good and holy people to serve the Church,” he said. People also want the sacredness of marriage to be reclaimed, Father Nagel said. 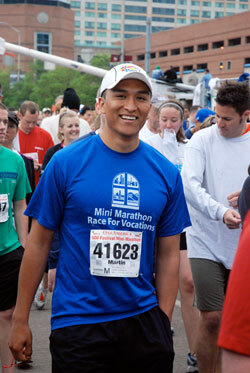 As the “Race for Vocations” T-shirt reminds us, we all have a vocation.